You can never give without caring, so if you really care, perhaps you should care for a Gift Card from Westside. 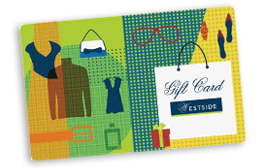 A Gift Card from Westside is sure to delight all your loved ones, your fashionista friend, your prim and proper brother, your finicky mom to your stylish son. Westside has a collection of lovely ethnics, latest tops, well tailored work wear, really pretty pieces of home décor and upholstery and cute as button clothes for kids. Westside spells quality and the best of India can be found here. Look no further, buy the best for your loved one, choose a Westside Gift Card – as their brand catch phrase suggests, there really are endless possibilities at Westside. Check out the listing of a range of brands, outlets, travel portals and more to choose from at Giftbig.com. You can find something that fits your budget and delights your loved ones, Giftbig.com is a one stop shop for all your gifting needs, for all occasions for everyone! 1. Accepted in all Westside stores in India. 2. Period of Validity:1 year from initial load or last reload. 3. Valid on all merchandise. 4. Redeemable during End of Season Sales, Promotions & Offers. 6. This Gift card cannot be exchanged for Cash/Gift Cards/Credit Notes. 7. Only valid gift cards would be accepted. 8. Any disputes/s shall be subject to the jurisdiction of the courts in Mumbai. 9. Trent Limited reserves the right to amend the Terms & Conditions at its discretion without prior notice. 10. This card is the property of TRENT LIMITED. 11. Please refer to www.mywestside.com for more important Terms & Conditions. 12. To check balance SMS– WS card number to 09094774499 or log ontohttp://westside.giftbig.com/westside/balenq. Email: mywestside@trent-tata.com | Tel: 91-022-6700 9000 | Address: Trent Limited Trent House, G Block, Plot No C - 60, Beside Citibank, Bandra Kurla Complex, Bandra (East), Mumbai 51 | Website: www.mywestside.com.